Having felt the strain of a Right-wing government for so long, the benefits of a change to the Left would be welcome writes Canberra correspondent John Passant. THE LAST DAYS of Federal Parliament this year were a complete shemozzle for the Morrison Government. There I was on Thursday with managing editor David Donovan and senior editor Michelle Pini as the final act in the comedy that is Parliament played out. 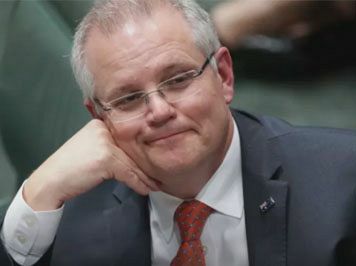 The Government did everything it could, including filibustering in the Senate, to avoid a vote in the House on an amended bill that would have, if passed by both Houses, allowed the timely transfer of sick people from Nauru and Manus Island to Australia. If the vote had happened on Thursday last week, the Government would have lost. The Coalition succeeded in their stalling tactics, if avoiding scrutiny is a success. The Government also scared Labor into supporting an encryption bill that is the harshest and most dangerous government intervention in the world. It did this by muttering the magic words “border protection”, “terrorists” and “security”. Scott Morrison and his crew have little to offer the electorate other than mantras about border security, keeping Australia safe, cutting immigration levels and stopping brown people coming here. Oops, that latter should read “border protection” (know what I mean? nudge nudge, wink wink) with a dash of lies about “saving lives at sea” and “stopping the people smugglers” thrown in. So how is it that a government presiding over what has essentially been a good economy with low unemployment and okay growth figures looks set to be smashed in the 2019 election and has to rely on fear campaigns to try to retain or win votes? The big issues for voters are stagnating wages and the worsening of public services like public health, public education and public transport. The Government has nothing to say that addresses these issues in any meaningful way. Well, as we get closer to the election, probably on 11 or 18 May, the Government will throw lots of money at voters to try to convince them it does care about the health system, education and transport. It will be a three-card trick. For example, the Government announced an extra $1.2 billion in grants to the states and territories to spend on health ahead of Wednesday’s Council of Australian Governments meeting. The only problem is, as Victorian Premier Daniel Andrews has pointed out, is that this extra money does not make up for the amounts the Abbott/Turnbull/Morrison Government have cut from health spending over the last five years, with $2 bn cut from Victoria alone. Other increased spending or tax cuts will come out of bracket creep, increased profits and the increased revenue that both have produced. Again, any extra spending is unlikely to match the amounts already cut from the relevant budgets for socially useful spending. The Coalition easily found the money to spend on proposed (but rejected by the Senate) tax cuts to big business ($48 bn over ten years), on submarines ($50 bn over a decade just for building 12 of them and assuming no cost blowouts, plus another $50 bn for their ongoing operation over that period), and 72 new aeroplanes ($17 bn from 2016 till 2035). The money is there if they want to find it. A progressive government might in addition look to save $1 bn a year by closing down Australia’s offshore concentration camps on Manus Island and Nauru and welcoming refugees and asylum seekers. As I have argued elsewhere, a Left-wing government might also close down the tax expenditures (lurks) for business to add an extra $7 bn a year to the budget bottom line or, even better, spend on our public health and education systems and transport infrastructure. If that radical government also considered the current tax expenditure costs of superannuation tax concessions – in the order of $40 bn in 2017 – compared to the pension outlay in 2017 of $45 bn, there might be some money there that could be spent on lifting the age pension and maybe making every worker over the age of 60 eligible for it after a lifetime of hard work. Then such a government could also consider increasing Newstart, for example, along with other social support payments. Question time in federal parliament https://t.co/bFyQomUoqs - the LNP cut funds so badly that the next government needs to spend to bring education, health & pension benefits somewhere they need to be. Morrison lives in a time warp, lies about cut, not a trustworthy individual. Australia is a low tax country. We could easily squeeze the rich until the pips squeak. Unfortunately, there is no Jeremy Corbyn in Australia. The Coalition policies of bashing asylum seekers and immigrants, Aborigines and Torres Strait Islanders, LGBTIQ+ people and creating fears of “terrorist” attacks will not address systemic economic issues like stagnating wages, unemployment and underemployment, precarious jobs or inadequate public health, transport and education. The Government’s megaphone dog whistling does, however, create an opening for the explicitly xenophobic and racist Right and the fascists to exploit and, if the economy worsens, to grow. If the economy worsens, as it could, then the far Right could gain many more adherents and supporters with their racism and xenophobia and simplistic and populist demands and “solutions”. The phrase “far Right”, in my view, spans sections of this Government on to One Nation and then the fascists. They are a cauldron of racism, xenophobia and othering bubbling away, reinforcing each other in their similar messages even if they are competing politically for votes and support. That is why we need a Left movement of the masses — to fight in our workplaces and on our streets for improved living standards for workers and for progressive social change and to force the reactionaries and fascists back under their rocks. The Yellow Vests in France show one way forward. A few weeks of protests and with majority and growing support, the Yellow Vests have forced major concessions on wages and taxes from Macron. It appears the protesters have rejected his offerings as smoke and mirrors and crumbs from the table. One difference between Australia and France is that in France the social democrats have disappeared after years in power implementing their version of neoliberalism. In Australia, our social democrats look set to win power and implement their own version of neoliberalism. This means we may have to wait a few years for the yellow vests to begin amassing on the streets of Sydney and Melbourne. Even so, we need a mass movement now that will keep the pressure on Labor in power to implement reforms for the people, not the profiteers. In building that, we can build a machine to drive the Morrison Government out of power. The trade unions’ Change the Rules is not that mass movement. It is a movement of the union bureaucracy aimed at electing a Labor Government. It is not a movement of the people. If we don’t fight whoever is in government managing neoliberal capitalism, we lose. It’s time to go, ScoMo and any other government that puts profit before people. The task is up to us, not Labor or the Greens or the union leadership, but us — ordinary workers and others united in fighting for a just and equitable world socially, economically and politically and showing enough power and emotion, as French workers have shown, to frighten our leaders into governing for workers and the poor.